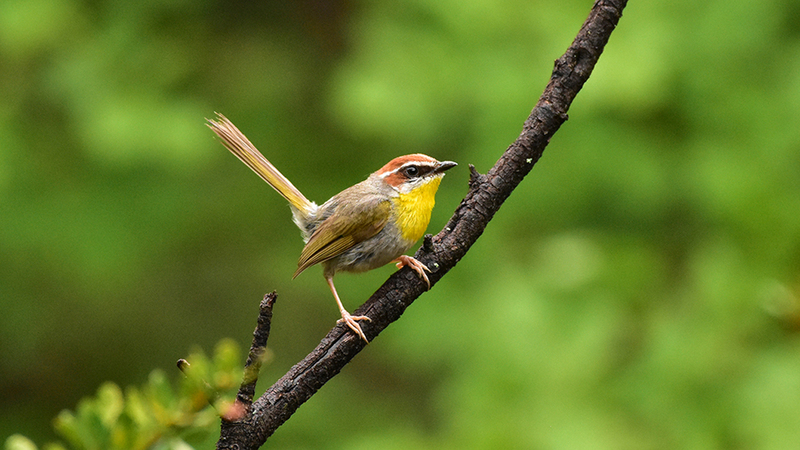 One of the main highlights of the trip was this wonderful Rufous-capped Warbler that showed so well in Miller Canyon. Photo by participant Henry Trombley. Our 2018 Arizona Second Spring Tour was a big success. The monsoon season is a wonderful time to explore the varied habitats of southeast Arizona when wildlife responds quickly to the sudden arrival of rainfall to the area. Things got off to a good start with a brief visit with a Burrowing Owl on our way out to the Sonoran desert west of Tucson to track down Gilded Flicker. The rest of the trip was spent exploring areas south and east including the Huachuca Mountains, where we had our first views of Elegant Trogon, the spectacular Chiricahuas, a sampling of waterbirds around Willcox, a brief visit to the Santa Catalina Mountains (take that, Red-faced Warbler! ), and the Patagonia-Nogales corridor and California Gulch and the Atascosa highlands. There were so many wonderful sightings and experiences along the way, ranging from eye-popping views of Rufous-capped Warbler in Miller Canyon, the nesting Elegant Trogons in Cave Creek, our nighttime encounter with Buff-collared Nightjar in Warsaw Canyon, the not-a-cow Black Bear that Mary spotted in the Chiricahuas, the wonderful young Gray Fox we watched up near Rustler Park, the colorful Western Black-tailed Rattlesnake cruising the road below Portal, and all of the various invertebrates from scorpions, vinegaroons, and tarantulas to the terrifying giant Curve-faced Windscorpion. The weather itself provided for a view spectacular settings like our time in Willcox watching thunderstorms develop around us in all directions. There were some other memorable microbursts observed in the Chiricahuas. Thankfully skies were clear at times, providing stunning planet gazing opportunities, such as our five planet sweep (Mercury, Venus, Jupiter, Saturn, and shortly thereafter Mars) panning from west to east. At other times, the clouds made for some spectacular sunrises and sunsets. 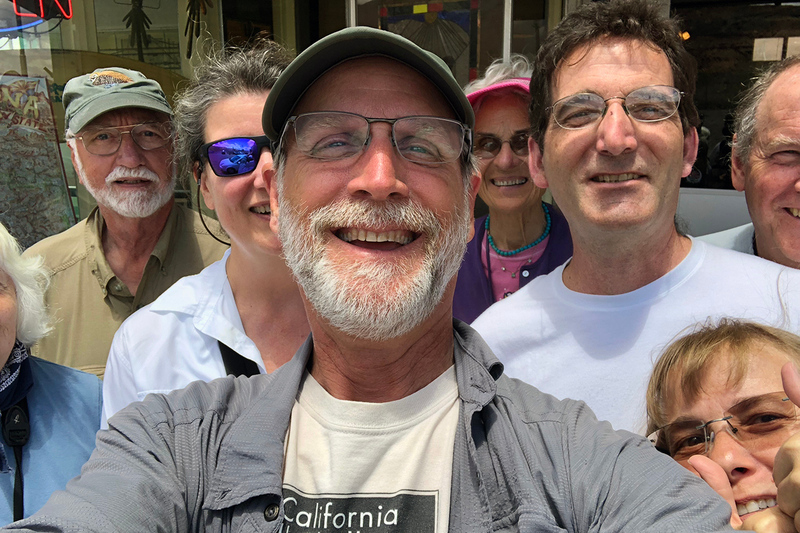 The gang hamming it up for the camera after our yummy lunch in Bisbee. Too bad it wasn't just a bit more wide angle! Photo by guide Chris Benesh. GADWALL (Mareca strepera) – There was an unseasonal pair of these at Willcox. MALLARD (MEXICAN) (Anas platyrhynchos diazi) – We saw a fair number of these, especially at Patagonia Lake. Considered by some authorities as a full species separate from Mallard, now including eBird. REDHEAD (Aythya americana) – One summering at Willcox. 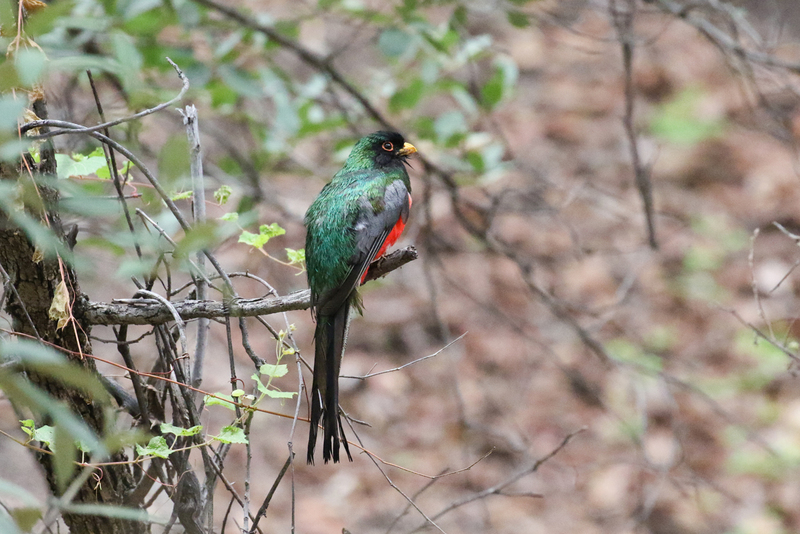 Our first encounter with Elegant Trogon was in Huachuca Canyon where we saw this handsome male. Photo by guide Chris Benesh. SCALED QUAIL (Callipepla squamata) – Some nice looks at these cotton tops in the grasslands east of the Chiricahuas. 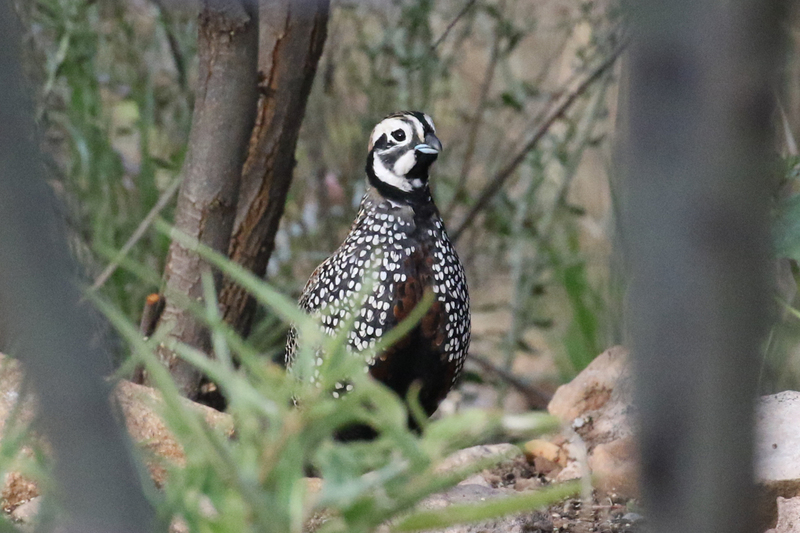 MONTEZUMA QUAIL (Cyrtonyx montezumae) – Great views of a pair of birds visiting Mary Jo's feeders. Another pair was near the Chiricahuas visitors center one evening, and still more on our way through California Gulch. WILD TURKEY (Meleagris gallopavo) – Seen at Mary Jo's place and again at the Southwestern Research Station in the Chiricahuas. NEOTROPIC CORMORANT (Phalacrocorax brasilianus) – This and the next species were at Patagonia Lake. Our morning visit to Mary Jo's paid off with great views of a pair of Montezuma Quail. Photo by guide Chris Benesh. BLACK-CROWNED NIGHT-HERON (Nycticorax nycticorax) – At least 10 were at Willcox. WHITE-FACED IBIS (Plegadis chihi) – There were four of these in Willcox. 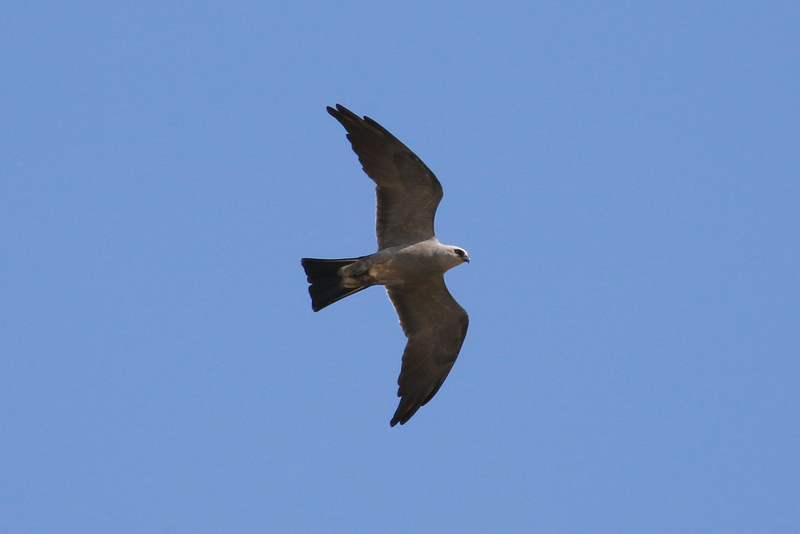 MISSISSIPPI KITE (Ictinia mississippiensis) – We tracked down a couple of these elegant raptors in St. David. 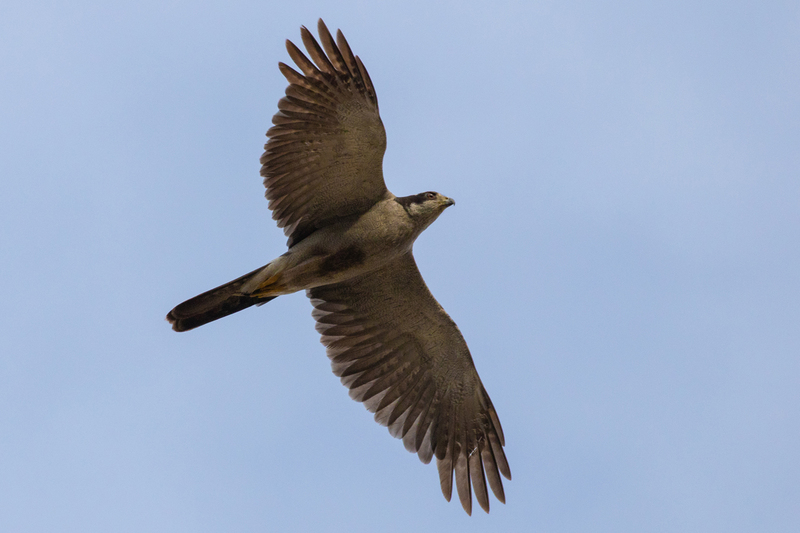 NORTHERN GOSHAWK (Accipiter gentilis) – An amazing encounter with an adult bird flying around over Mary Jo's place. We also heard some young birds calling in Miller Canyon. 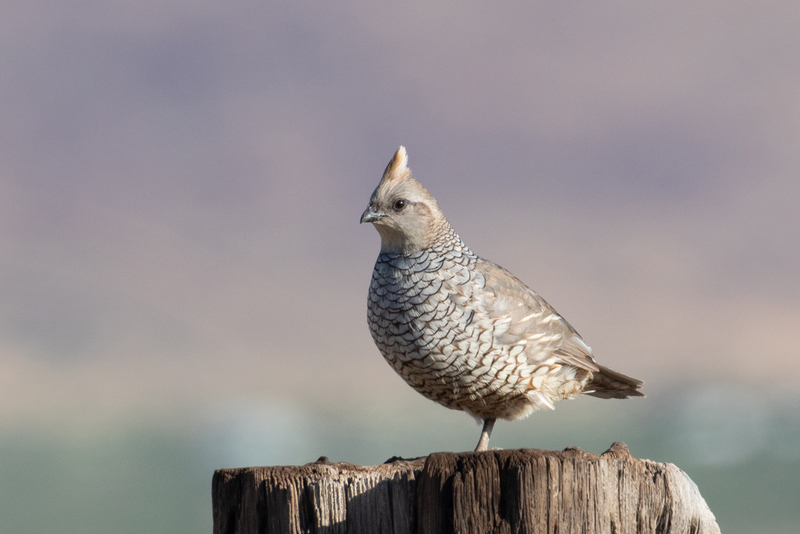 This handsome Scaled Quail was seen along Stateline Road. Photo by guide Chris Benesh. 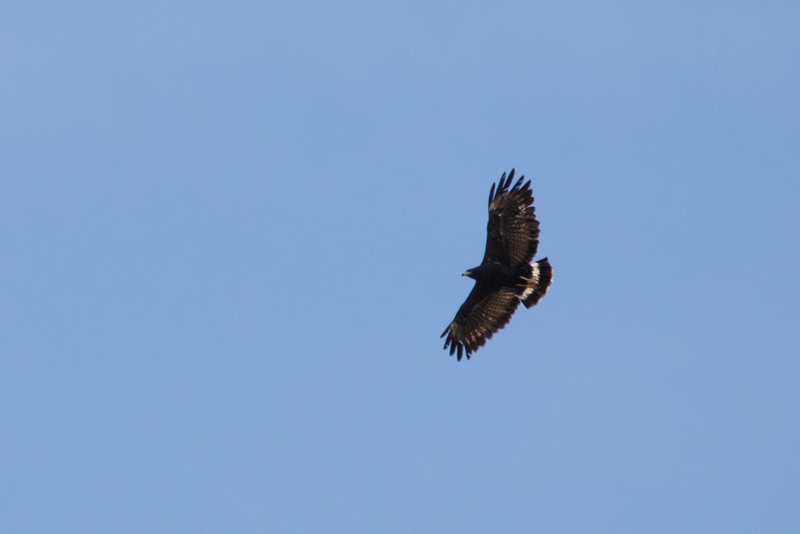 COMMON BLACK HAWK (Buteogallus anthracinus) – A terrific addition at Patagonia Lake as we were preparing to leave. HARRIS'S HAWK (Parabuteo unicinctus) – This species has been patchy in recent years on this tour route. Thankfully we had a cooperative group of them in Willcox on our way through there. GRAY HAWK (Buteo plagiatus) – Several good views of this species. ZONE-TAILED HAWK (Buteo albonotatus) – It was a good trip for this species too. While at Mary Jo's place, we had a spectacular flyby of this adult Northern Goshawk. More were heard in Miller Canyon. Photo by guide Chris Benesh. LONG-BILLED CURLEW (Numenius americanus) – There was a group of eighteen at Willcox. A bit of added excitement toward the end of the trip came by way of this Common Black Hawk that showed well at Patagonia Lake. Photo by guide Chris Benesh. BAND-TAILED PIGEON (Patagioenas fasciata) – Seen in the Huachucas and Chiricahuas. One of the Mississippi Kites we encountered in St. David. Photo by guide Chris Benesh. INCA DOVE (Columbina inca) – Scarce in southern Arizona, we managed a single sighting at the Paton's. COMMON GROUND-DOVE (Columbina passerina) – A few at Kino Springs and near Tumacacori. GREATER ROADRUNNER (Geococcyx californianus) – Several nice encounters with this iconic southwestern bird! WESTERN SCREECH-OWL (Megascops kennicottii) – We managed to track one down near our motel in Portal. 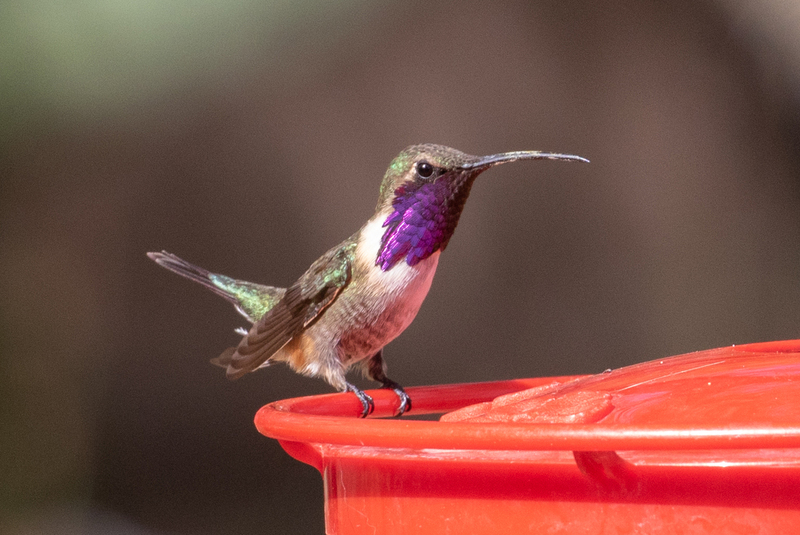 Our visits to Mary Jo's place provided some great views of Lucifer Hummingbird. Photo by participant Henry Trombley. WHISKERED SCREECH-OWL (Megascops trichopsis) – A treat in lower Miller Canyon. NORTHERN PYGMY-OWL (Glaucidium gnoma) – The only one seen was one along East Turkey Creek in the Chiricahuas. ELF OWL (Micrathene whitneyi) – There were a couple of furtive birds along Silver Creek in the Chiricahuas. 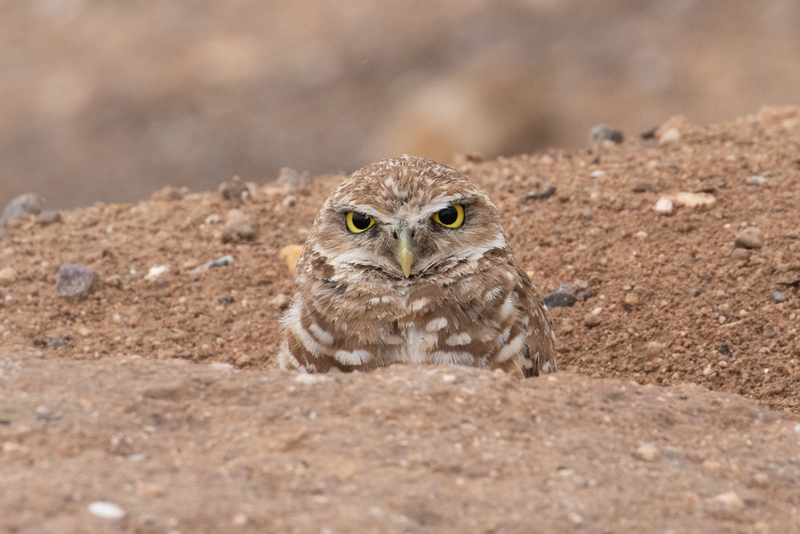 BURROWING OWL (Athene cunicularia) – One was hanging out at its usual spot in Tucson. BUFF-COLLARED NIGHTJAR (Antrostomus ridgwayi) – A magical evening in Warsaw Canyon south of the confluence, we joined up with Melody Kehl and her group and enjoyed this species. A Burrowing Owl peers out at us from its nest burrow. Photo by guide Chris Benesh. MEXICAN WHIP-POOR-WILL (Antrostomus arizonae arizonae) – Well heard and seen a few times in flight in Cave Creek. RIVOLI'S HUMMINGBIRD (Eugenes fulgens) – Name changed as part of a recent split in the species. BLUE-THROATED HUMMINGBIRD (Lampornis clemenciae) – The Chiricahuas continues to the be the stronghold for this species. Several seen well at SWRS. LUCIFER HUMMINGBIRD (Calothorax lucifer) – Mary Jo's once again proved to be the place to see this scarce species. We had a few wonderful studies. 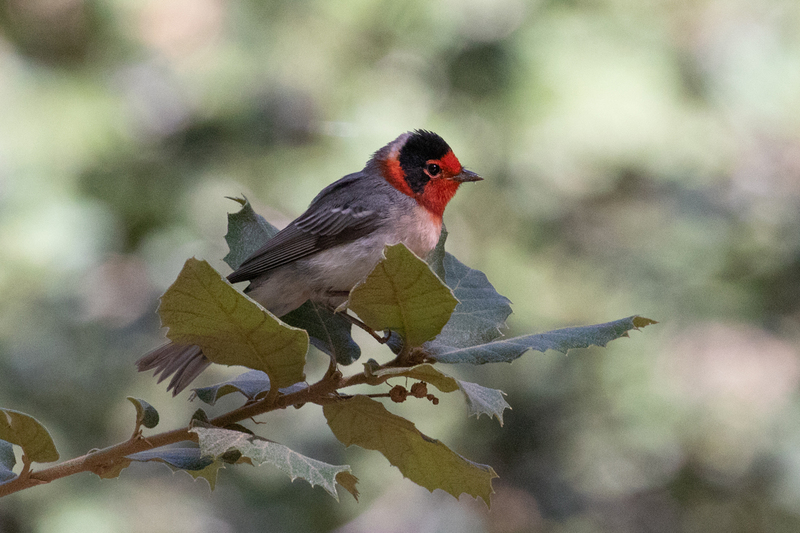 What a relief to finally encounter the stunning Red-faced Warbler on Mt. Lemmon. Photo by guide Chris Benesh. CALLIOPE HUMMINGBIRD (Selasphorus calliope) – Great looks at this tiny species at the George Walker House in Paradise. It got a couple of votes for trip favorite. VIOLET-CROWNED HUMMINGBIRD (Amazilia violiceps) – Our first one was at Beatty's in Miller Canyon. Also seen at Paton's and briefly the Roadside Rest. ELEGANT TROGON (Trogon elegans) – One of the most popular birds of the trip; we had a couple of nice encounters. Our first was in Huachuca Canyon, and later Dave Jasper directed us to a nest along South Fork in the Chiricahuas. In Carr Canyon, we had some great views of Olive Warbler, which is in a family all its own. Photo by participant Henry Trombley. GILDED FLICKER (Colaptes chrysoides) – We managed to track one down after a lot of searching on our first afternoon in the Tucson Mts. NORTHERN BEARDLESS-TYRANNULET (Camptostoma imberbe) – We saw our first one in Portal, where this species has only recently become established. Another pair were along the Santa Cruz River while we were seeking becards. GREATER PEWEE (Contopus pertinax) – We saw birds in Carr Canyon, high in the Chiricahuas, and on Mt. Lemmon. The Mexican Chickadee has a really limited range in the United States, with the only accessible spot being the Chiricahuas. Photo by guide Chris Benesh. BUFF-BREASTED FLYCATCHER (Empidonax fulvifrons) – Quite a few of these were in upper Carr Canyon. One of the more distinctive Empidonax. VERMILION FLYCATCHER (Pyrocephalus rubinus) – Seen a variety of places, this species is always a treat to see! 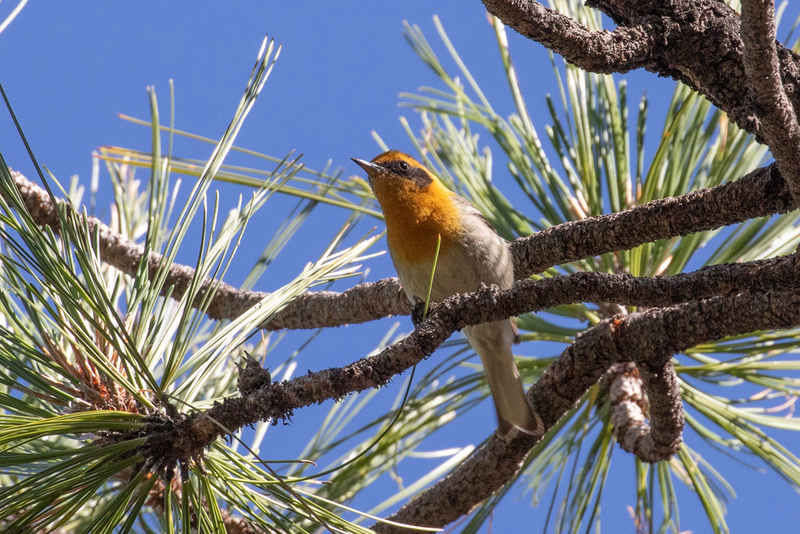 We had several nice encounters with Sulphur-bellied Flycatcher. Photo by guide Chris Benesh. THICK-BILLED KINGBIRD (Tyrannus crassirostris) – We had several, including birds in Portal, the Roadside Rest, and Santa Gertrudis Lane. This species has expanded its foothold in the state recently. ROSE-THROATED BECARD (Pachyramphus aglaiae) – Once we found the right spot to view the nest we had good looks at a pair of birds near Tumacacori. There are now apparently several pairs nesting along the Santa Cruz River. Stateline Road was the place to see Bendire's Thrashers. Photo by guide Chris Benesh. WOODHOUSE'S SCRUB-JAY (Aphelocoma woodhouseii) – We managed to find a single bird along the Paradise Road. 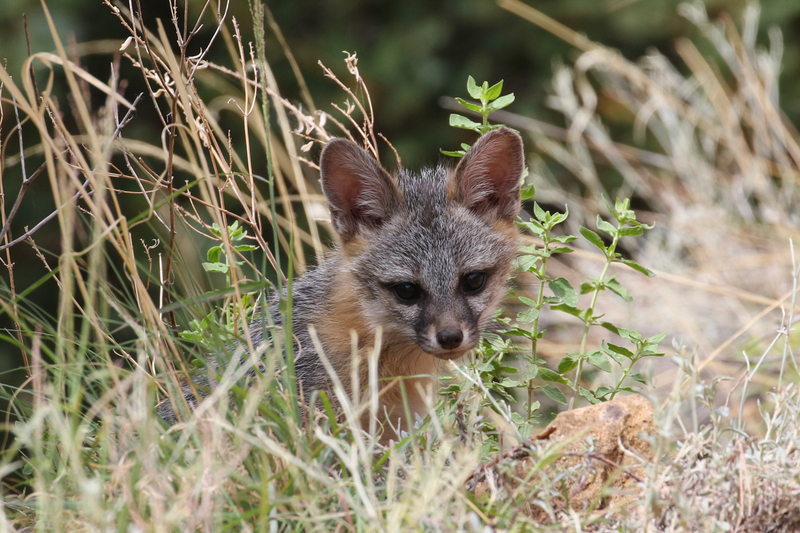 Another big highlight of the tour was this adorable young Gray Fox that we studied high in the Chiricahuas. Photo by guide Chris Benesh. PURPLE MARTIN (Progne subis) – Seen in the Sonoran desert west of Tucson. MOUNTAIN CHICKADEE (Poecile gambeli) – Seen on Mt. Lemmon during our visit there. 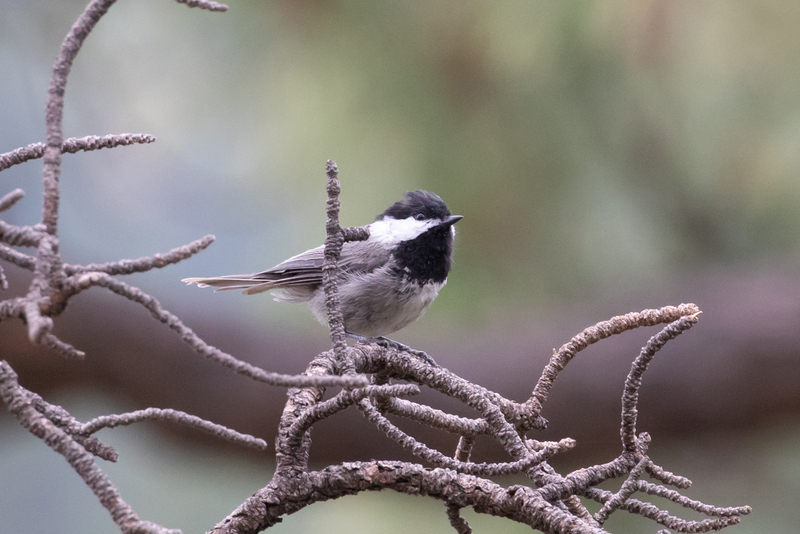 MEXICAN CHICKADEE (Poecile sclateri) – Good numbers of these were evident in the Chiricahuas, the only accessible range that this species occurs in the US. 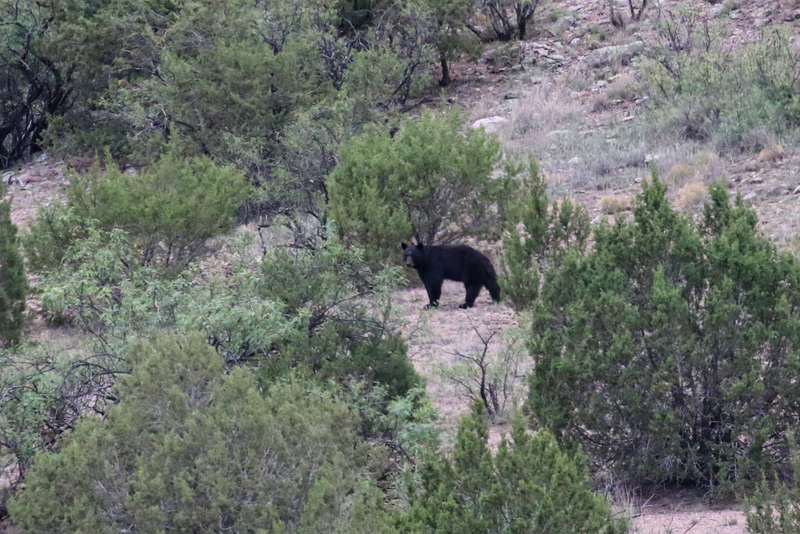 Mary's Black Bear, which she spotted at a great distance along the Paradise Road in the Chiricahuas. Photo by guide Chris Benesh. RED-BREASTED NUTHATCH (Sitta canadensis) – Up high in the Chiricahuas and again on Mt. Lemmon. ROCK WREN (Salpinctes obsoletus) – Our only one was at the Roadside Rest. 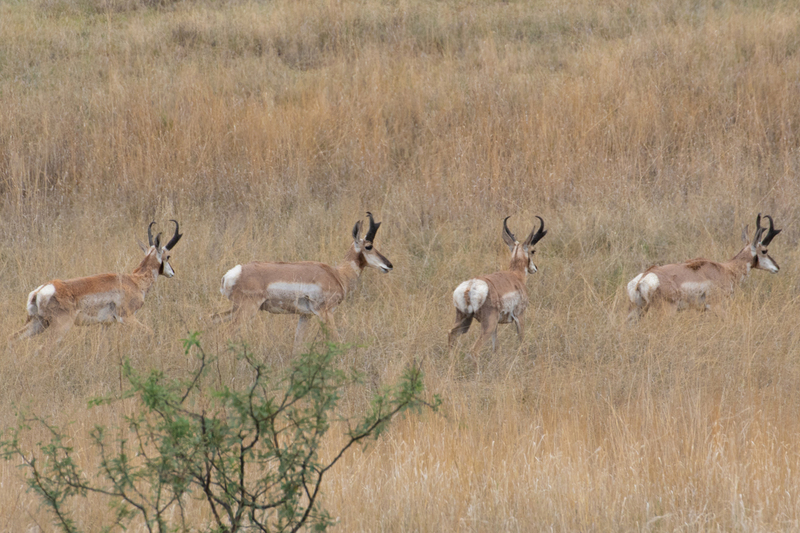 A beautiful group of Pronghorn in the grasslands. Photo by guide Chris Benesh. BLACK-CAPPED GNATCATCHER (Polioptila nigriceps) – We had two of these near the Florida Work Study area. EASTERN BLUEBIRD (Sialia sialis) – We had one on our way out of Fort Huachuca. WESTERN BLUEBIRD (Sialia mexicana) – We had two up high in the Chiricahuas. 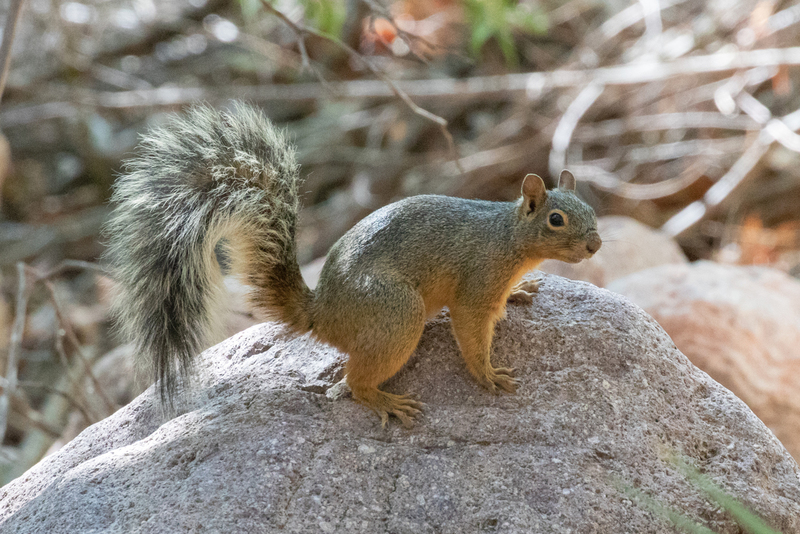 A Mexican Fox Squirrel, which is found in the United States only in the Chiricahuas. Photo by guide Chris Benesh. 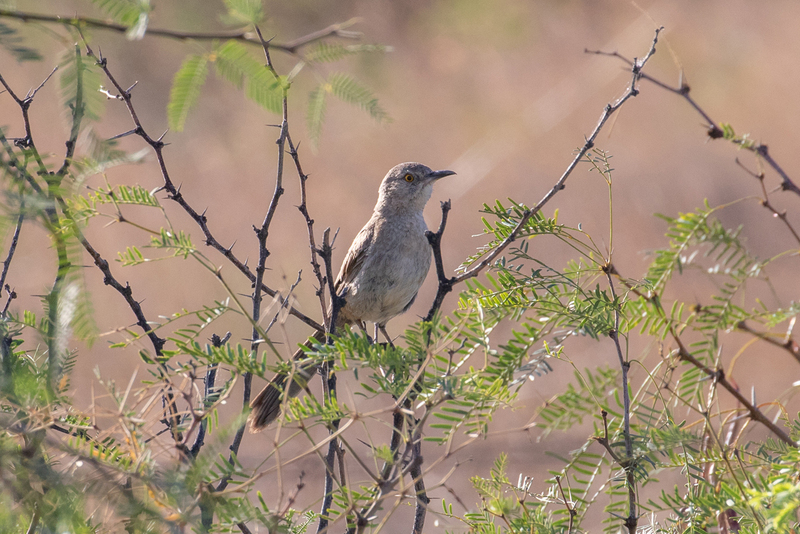 BENDIRE'S THRASHER (Toxostoma bendirei) – Well seen along Stateline Road east of the Chiricahuas. 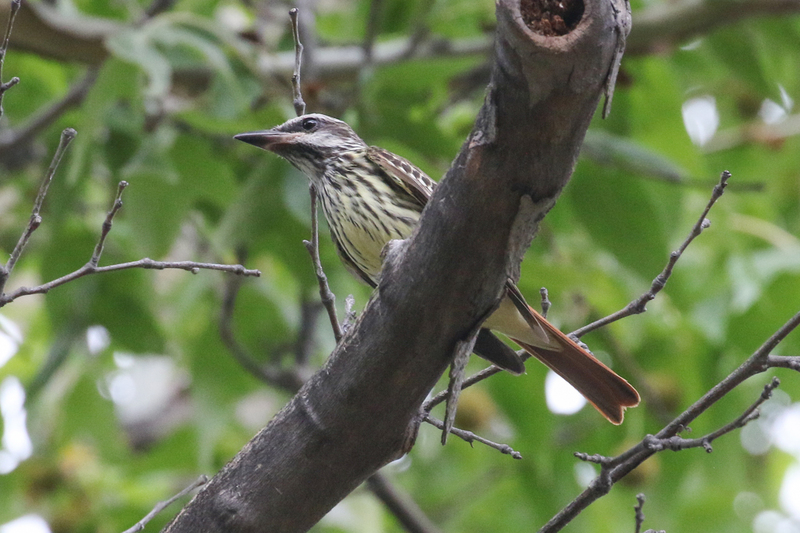 CRISSAL THRASHER (Toxostoma crissale) – Always a tough one this time of year, but we had several encounters. OLIVE WARBLER (Peucedramus taeniatus) – A few nice studies of this species that is in its own family. 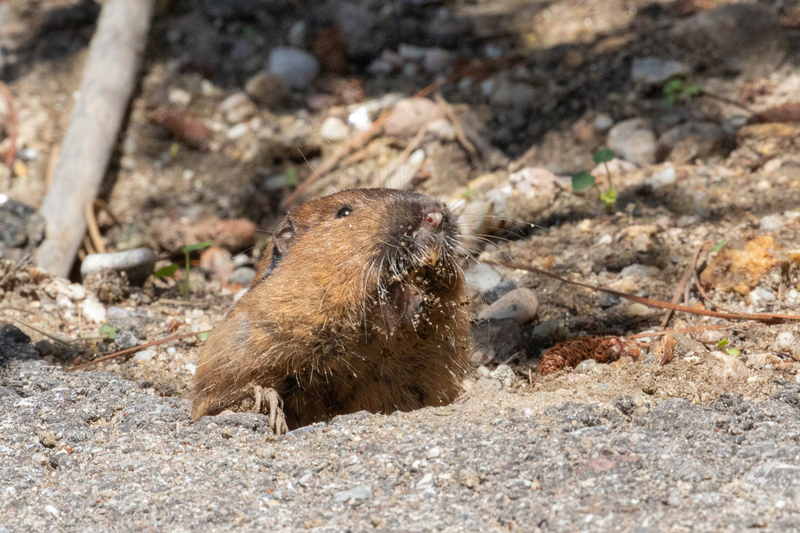 This Bottae's Pocket Gopher was active while we were watching the feeders in Summerhaven. Photo by guide Chris Benesh. RUFOUS-CAPPED WARBLER (Basileuterus rufifrons) – We had amazing views of one in Miller Canyon that was really responsive to my squeaking. This proved to the most popular sighting of the trip for several. RED-FACED WARBLER (Cardellina rubrifrons) – This species proved elusive for us in both the Huachucas and Chiricahuas, but we were able to track down several on Mt. Lemmon! Whew! A beautiful Western Black-tailed Rattlesnake seen near Portal. Photo by guide Chris Benesh. PAINTED REDSTART (Myioborus pictus) – Always a treat! 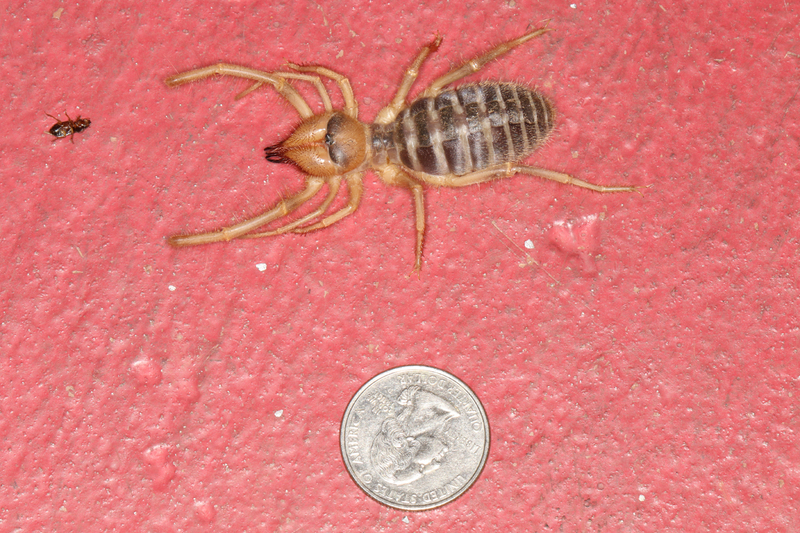 This was the Round-faced Whipscorpion that startled some on our return from owling in Sierra Vista. Photo by guide Chris Benesh. FIVE-STRIPED SPARROW (Amphispiza quinquestriata) – We saw a soggy one on our first morning in Box Canyon and then enjoyed another one while in Warsaw Canyon before our picnic dinner there. Quite a range restricted species in the US. 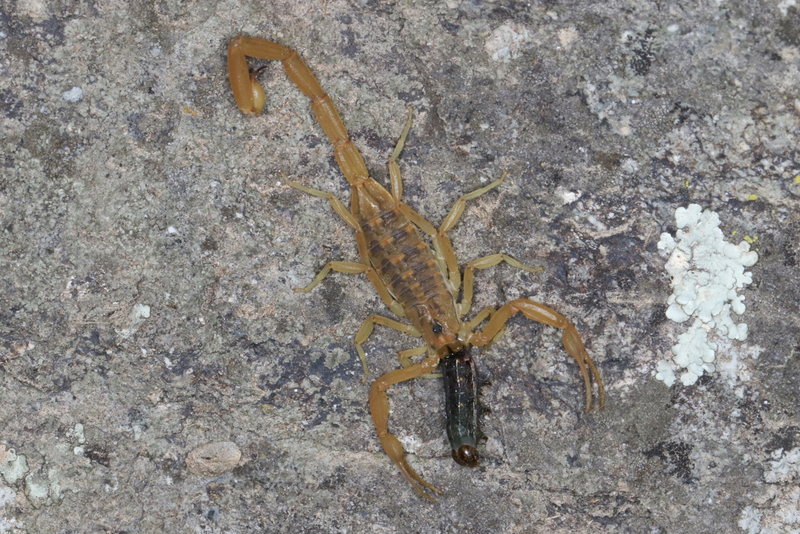 This is an Arizona Bark Scorpion that we found while black-lighting in California Gulch after our evening there. Photo by guide Chris Benesh. YELLOW-BREASTED CHAT (Icteria virens) – Now in its own family. HEPATIC TANAGER (Piranga flava) – Several sightings in the mountains but also a pair of birds along the Santa Cruz River. 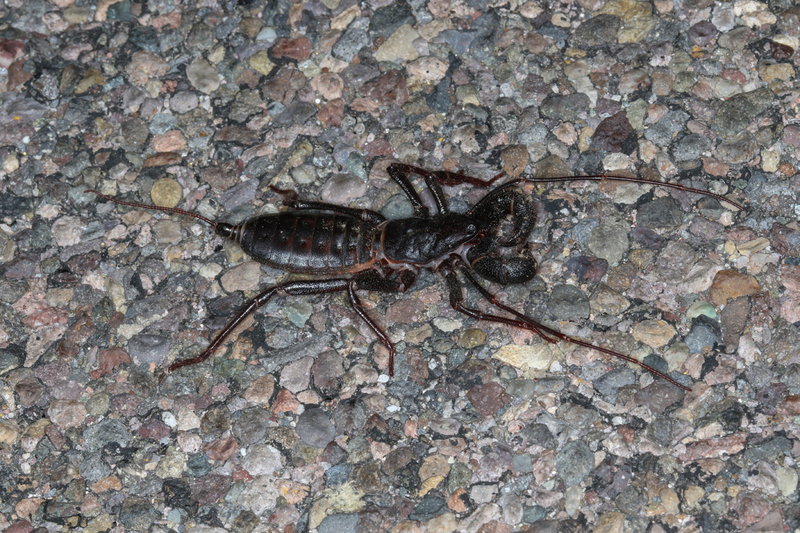 This scary looking but harmless creature is known as a Tohono Vinegaroon. Photo by guide Chris Benesh. INDIGO BUNTING (Passerina cyanea) – There were two territorial males at Beatty's in Miller Canyon. VARIED BUNTING (Passerina versicolor) – This terrific species was seen in lower Florida Canyon and again at the Roadside Rest. YELLOW-HEADED BLACKBIRD (Xanthocephalus xanthocephalus) – A couple of these were in Willcox. 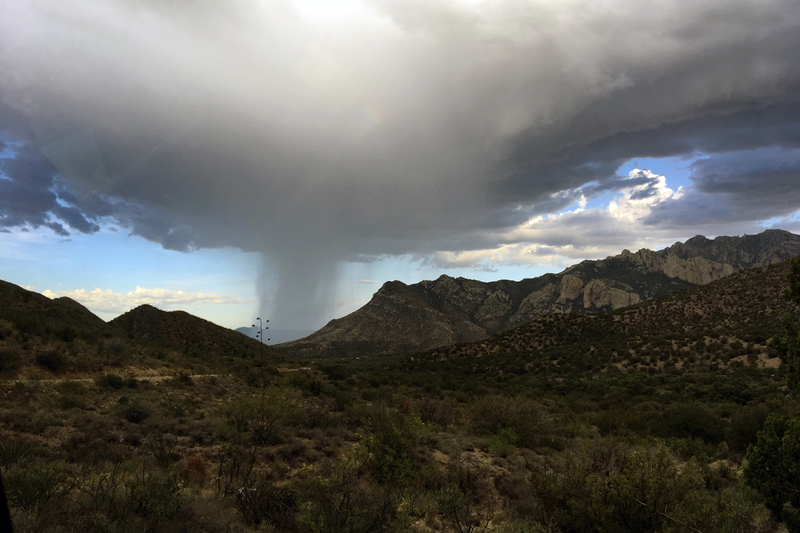 Mary Trombley's evocative shot of a small microburst in the Chiricahuas captures the random and sporatic nature of the monsoon rainfall. GRAY FOX (Urocyon cinereoargenteus) – We had an amazing encounter with this species high up in the Chiricahuas where we came upon a young fox pup trying to keep up with mom. BLACK BEAR (Ursus americanus) – "That's not a cow!" exclaimed Mary as she spotted a Black Bear walking along the hillside above Silver Creek on the Paradise Road. COLLARED PECCARY (Tayassu tajacu) – A couple of sightings in the Chiricahuas. Also known as Javalina. Yarrow's (Mountain) Spiny Lizard (Sceloporus jarrovii) Seen in various mountain ranges. Western (Tiger) Whiptail (Aspidoscelis tigris marmoratus) Seen the first afternoon in Tucson Mountain Park. 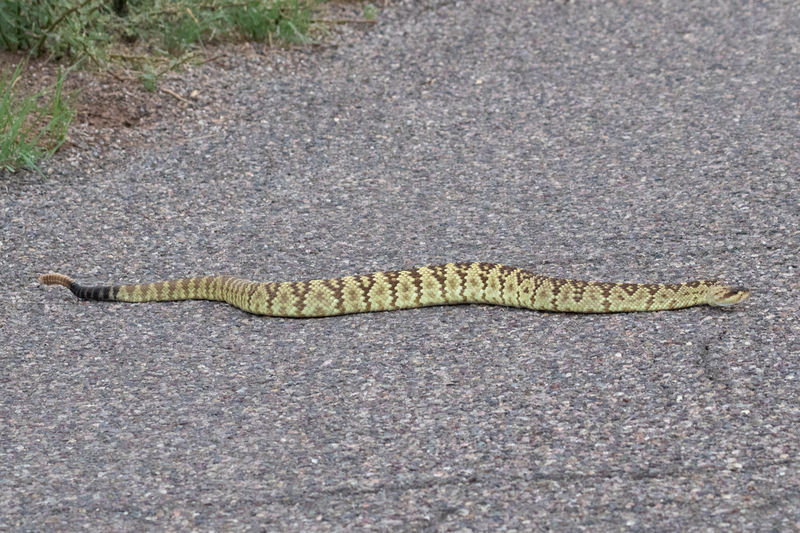 Western Black-tailed Rattlesnake (Crotalus molossus) One seen crossing the road near Portal. Sonoran Desert Toad (Incilius alvarius) Seen near California Gulch. We also had a nice assortment arthropods from tarantulas, whipscorpions, windscorpions, and scorpions.